In Mike Grehan's New Signals to Search Engines he highlights how personalization, social media, and universal search may help move search beyond text and links. Mike also contended that ranking reports are dead. While clients should see the end effect of optimization in their analytics and sales data, ranking reports still have good value to professional SEOs. Below are a couple examples of why and how ranking reports are still important, even as Google crowds the organic search results with universal search stuff. When you build a new site from scratch you get to see how effective your link building strategies are as the site's rankings improve. You have to get in the game before you compete...ranking improvements give you an idea of how your site's trust is growing even before you rank well enough to receive much stable traffic. This early feedback data can be used to guide further investment in link building efforts, and prioritize which websites get the most effort and investment. If you sell services to clients and they have a brand new site with limited traction then a ranking report shows baseline rankings and proof of growth, even before top rankings yield lots of traffic. This helps customers have confidence in their SEO provider, even if their SEO investment loses money before making it back. If you rank on page 2 or 3 for some high value keywords you might not see much traffic from them. But if your keyword rankings let you know that you are close to the top you can consider working on link building and altering your site structure to improve the rankings of those pages. 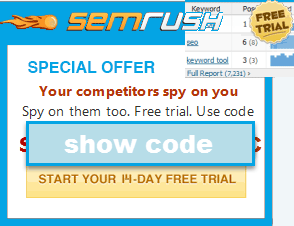 Services like SEMRush also help give insights into such ranking improvement opportunities. How Are Search Algorithms Shifting? Is Google putting more weight on authority sites? How much does the domain name count (if at all)? Is anchor text becoming more important or less important? How aggressive should you be with anchor text? When major algorithm updates happen, tracking a wide array of sites and keywords can help you hypothesize what might be gaining importance and what might be losing importance. What Happened to My Google Traffic? Sometimes sites get filtered out of the search results due to manual penalties, automated penalties, automated filters, algorithm changes, or getting hacked. Sometimes the issues are related to particular pages, particular folders, whole sites, or keywords closely related to (or containing) another word. Seeing a traffic drop gives you some clues that something may be wrong, but one of the easiest ways to isolate the issue and further investigate is to look at ranking reports to see what keywords and what pages were affected...then you can start thinking about if it was a glitch, something you can fix, or something you can't. Cross referencing keyword ranking reports with traffic reports can tell you where to prune your marketing efforts and optimize else where. I still use ranking reports as a diagnostic tool. In fact, they recently helped me diagnose a problem with an analytics installation that was incorrectly tracking organic traffic. Ranks were up and traffic was down. While there are cases where that can happen (e.g. seasonal factors), the discrepancy forced me to dig deeper which in turn identified the analytics issue. For me conversions are more important than a mere ranking report. In fact I always look at analytics every morning, and the conversions. A ranking report to me is like a military count of heads - the officer feels good if all of the soldiers are present, but that does not mean they can win a war. Also a good ranking may not get traffic. And a lot of traffic may not get conversions. So ROI - to me thats important. Amongst those 10,000 soldiers are the handful whose absence can lose you the war, and another handful whom you can train a bit more to win you the war (which Aaron has discussed above). And unless you track ranking, I think it is extremely hard to know what specific ranking factors still work and to what extent. I was once trying to optimize a page which was ranking in the 50s. I just removed 2 unnecessary words from it's Title and the ranking came to 20-22. There wasn't the least bit of difference in traffic or conversions but I learned how much that specific factor works. When you are playing on the first page, it's too difficult to track the factors because many other factors come into play, like the bounce rate, clickthroughs, extra links (people linking to you because they found you on first page), etc. To sum up, change in SEO factors is highly proportional to rankings so a slight change can tell you if you are doing right or not. And you have a wide ground to track it (up to 1000 results). Whereas the change in traffic comes down to the top 20-30 results maximum. SEO begins with rankings and ends at your bank account. Rankings->Traffic->Conversions->$$$. Taking out the rankings, IMO, is like jumping to the second step of the ladder while the first one is missing. Agreed. However I never said that a ranking report is useless. It’s just that they are not my priority and conversions are more important. Your site may rank no 1 for your brand, but not for the keywords that bring sales - so WTF is the point of a ranking report? The point of a ranking report is all the items I listed above...understanding site growth, algorithm changes, site ranking issues, etc. To understand the full profile of a site it is helpful to track keywords of different difficulty levels, and in some cases to track low value keywords just to see how those rankings shift compared to high value keywords (as this may help clue one into how the algorithms change). ranking html documents alone. Personalized search nor "localized" will in no way, shape, or form change the essence of the concept of grading pages (or ranking). It will all become more interesting :) with the highest possible ROI as an eternal goal. I think a ranking report is good because it helps you to know whether or not you are progressing, however, getting the traffic would be so much more encouraging. I think showing clients traction for new efforts is one of the main uses of ranking reports...but I never offer them without a huge disclaimer about not putting too much weight on them, or using them as the sole measure of success. They are simply one more way for an SEO to communicate (in numbers) what their efforts are doing. And if you have a ranking report coupled with your traffic report, you can see the difference in how much traffic comes from which ranking...which can mean more budget allocated to you. I just received more budget by showing competitors ranking better (over time) for targeted keywords, and the ranking report was the way I showed it to the decision makers. My client hated to "lose" to a lesser brand, and was willing to pay me more to keep them on top. In my book, anything that allows me to wrangle more budget and longer contracts is worth it...and really, people get this aspect of measuring search more than any other. Sure, ROI is most important - but it is also about helping clients see the value of SEO, which is not always easy. Ranking reports make it easier. Rankings are also helpful in the case of discussing implementing services with a prospect who is not yet comfortable giving you access to their Analytics. If I can get a handful of keywords together that have decent search volume, and I can tell a company that they are not ranking within the top 10 results pages in the major engines for those terms, I can fairly confidently say that they are missing out on business for their site. Among the MANY posts about 'rankings are dead', this one is a welcome breath of fresh air, and I believe a more accurate picture of reality at this point. Thanks!